NEW ORLEANS – Like a train with no brakes going downhill, the cross country season is picking up speed. Ryan Thomas never finished better than fourth at a collegiate cross country meet until this past weekend when he went out and won the Paddy Doyle Meet of Champions hosted by Iona. In a meet loaded with three teams from the top-30, including his own Lions, Thomas covered the 8K tract at Van Cortlandt Park in 25:31.7 to beat Iona’s Jack O’Leary by two seconds and lead his team to victory. Thomas also toppled Arkansas’ Alex George and Cameron Griffith, both of whom finished inside the top-50 at last year’s NCAA Division I Cross Country Championships. If Thomas qualifies for NCAAs in November, it would be the first time he’d compete on that stage. Thomas has the pedigree to do so, as he won the Ivy League title in the outdoor 5000. Karissa Schweizer isn’t flying under the radar any longer. The three-time NCAA champion during the 2016-17 academic year opened her cross country season this past weekend at the Commodore Invitational in a big way. Schweizer, who won the 2016 NCAA XC individual title, demolished Erin Finn’s course record as she covered the 5K tract in 16:25.4 (Finn’s time was 16:43.4). She beat 2016 XC All-American Jordan McDermitt of Eastern Michigan by more than one minute. We should see Schweizer against some even better competition in the next month as she’ll likely compete at both the Cowboy Jamboree and Pre-National Invitational. Chico State senior Kyle Medina finished second overall at the UC-Riverside Cross Country Invitational this past weekend with a time of 23:58.3. Medina led the Wildcats to a second-place finish, behind only Southern Utah, which entered the race ranked 16th in the NCAA Division I polls. Medina finished 19 seconds ahead of his nearest NCAA Division II competitor. The senior from Ventura, California, ran the fastest time ever by an NCAA Division II athlete on the course while also setting the 26th fastest time in the history of the course. Hannah Wolkenhauer of Queens (N.C.) got a taste of what it’s like to compete against some of the best at the NCAA Division II level on the tract that will host the NCAA Division II Cross Country Championship meet this year. The native of Lincoln, Nebraska, won the Women’s 5K Division II race at the Stegemoller Classic National Preview this past weekend at the Angel Mounds Cross Country Course in Evansville, Indiana. Wolkenhauer’s time of 17:27.0 paced a field of 146, many of whom star for top-25 NCAA Division II squads. Queens (N.C.) finished second at the meet. Darin Lau made quick work of the St. Olaf Invitational this past weekend. Lau, a five-time All American during the 2016-17 academic year, rolled to the individual title in Northfield, Minnesota, with a time of 25:10.6. He beat Carleton’s Donson Cook-Gallardo to the finish line by 23 seconds. Lau also knocked off former NCAA DIII National Athlete of the Week Mark Fairley of Central College in the process (Fairley finished fifth). Many are looking for Lau to compete for the individual title come November in Elsah, Illinois, and performances like this past weekend’s show why. Each year she runs for the College of St. Scholastica, Casey Hovland keeps improving. That’s true for 2017 as well when it comes to the senior from North Branch, Minnesota. This past weekend at the St. Olaf Invitational, Hovland won by nearly seven seconds in a field stacked with several teams ranked in the top-35 of the NCAA Division III Women’s Cross Country National Coaches’ Poll. Hovland’s finishing time was 22:15.3. Hovland finished 33rd at the 2016 NCAA Division III Cross Country Championships. Chances are she’ll do better than that come November. 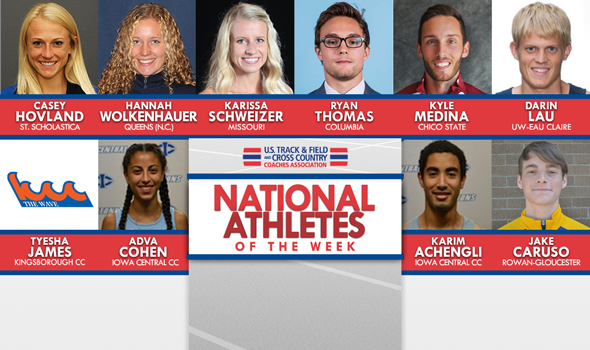 This isn’t Karim Achengli’s first National Athlete of the Week honor of the season. And judging by the way he’s competed this year, it won’t be his last. The native of Adra, Spain, won the Michigan State Spartan Invitational 8K with a time of 24:31.7, besting athletes from Michigan State, Grand Valley State, Bowling Green, Central Michigan and others. Iowa Central CC was the top NJCAA squad on the afternoon, and finished third overall behind Michigan State and GVSU, thanks in large part to Achengli’s dominance over the 360-plus competitors. Cohen’s time of 22:02.8 came against a slew of NCAA Division I and NCAA Division II talent in a race that featured more than 300 athletes. Jake Caruso was the top NJCAA Division III competitor in a field mostly comprised of NCAA Division III athletes at the Bill Fritz Invitational 8K, with the product from Berlin, New Jersey posting an eighth-place finish. The sophomore posted a time of 27:36.2 in a race that featured 161 athletes. Making her collegiate debut, Tyesha James finished sixth amongst collegiate performers at the Queensborough CC XC Invitational 5K, running a time of 21:06.1. The rookie competed against a plethora of completion from the NCAA Division II and NCAA Division III levels, and was the top NJCAA finisher out of 205 participants.